St. Bridgid 'Mary of the Gael'. Born in the mid-fifth century, and buried at Downpatrick beside St.Patrick and St. Colmcille. Bridgid built the first Irish Convent beside a giant oak tree -this place became known as the Church of the Oak (Cill Dara) or Kildare as it is known today. Daughter of a pagan chieftain - a stubborn unbeliever, before his death Bridgid sat by him in prayer, and whiled away the time by weaving the first St. Bridgid's Cross from the rushes strewn about the floor (rushes and rush matting was the floor covering of the time). Her father, seeing the Cross, asked ber to explain its meaning, and was so overwhelmed, became a Christian before his death. The St. Bridgid's Cross is placed in cottages, and out-offices on her feast day, February 1st, the day on which she died about 524 AD. It is believed this emblem protects the home, and animals from evil, and want. 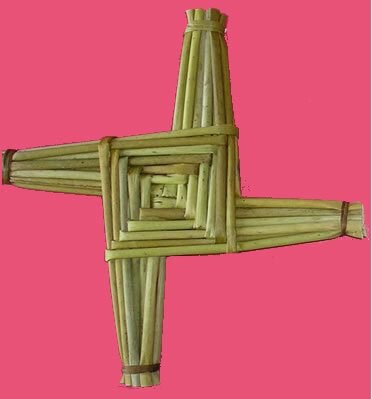 Tradition tells us that some time later every county in Ireland had its own design of St Brigid cross, however because of the nature of the material few specimens remain today. Presently Patricia weaves three different designs and these come in many different sizes. 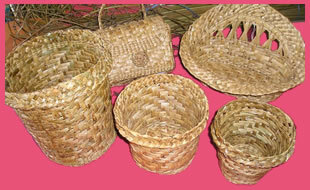 Baskets are creative, practical and durable, although traditional are modern and in keeping with styles of today. The product range includes wall hangings, shopping baskets, handbags, wastepaper baskets, lidded baskets, bread baskets, table mats and a variety of other items which can be make to order to customer requirements. These baskets are moulded into graceful shapes of donkey creels, fuel baskets, potato teemers and many more shapes. 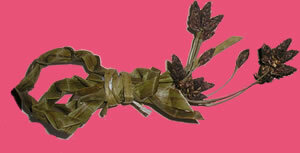 These baskets are very strong and this craft has flourished for over 1000 years. Blackthorn walking sticks and shillelaghs cut from blackthorn hedges in the west of Ireland. Traditional Aran Knitwear, Caps, Scarves, Mittens, Baby Boots, hand knit from pure new wool in a creamy white. Basket Pin-cushion consisting of a miniature rush basket with pad made of hand-woven tweed and decorated with Irish Crochet Lace, Tweed stuffed Donkeys with Rush Panniers. See our Gallery Page.